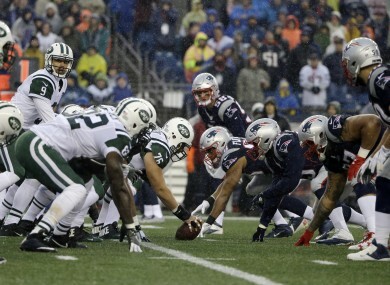 Players from the New York Jets and New England Patriots about to collide at the line of scrimmage. COLLISIONS IN A single game of American football have a similar force to that of 62 car crashes, according to new research. Using a mouthguard that can track the brain’s reaction to physical hits, researchers in America studied the impact of hits absorbed by an offensive lineman at the line of scrimmage and in similar scenarios. The impact of these hits are considered to be minor in isolation, but the accumulative damage of these blows can have similar effects to that of harder collisions that would produce more immediate symptoms of concussion. According to the data collected, the average G-force of 10 of the 62 hits recorded was akin to the force the lineman would experience if he crashed a car into a wall at 30mph. Head traumas like this can happen multiple times to players throughout their career, thus leaving them prone to developing concussion and other dangerous conditions such as neurological condition chronic traumatic encephalopathy (CTE). Dr Bennet Omalu, the Nigerian-American physician who discovered CTE in American football players, presented a similar argument when speaking on Newstalk’s Off The Ball last year. He said: “The issue is not about concussions. A concussion is a very severe type of injury that would manifest immediately with symptoms. For one documented concussion, there are thousands of sub-concussive blows. It is not about concussion, we should make that very clear. Using data recorded by the special mouthguard, scientists also discovered that the current design of American Football helmets are not fit for purpose in reducing the risk of concussion or CTE. Email “American football hits similar to 62 car crashes per game - new research”. Feedback on “American football hits similar to 62 car crashes per game - new research”.